We are the proud owners of this wonderful condo with exquisite private courtyard with picnic area with 4 grills, 2 pools, 2 hot tubs & 2 kiddie pools! Grab your family and friends and experience an unforgettable vacation at the beautiful and spacious Wildwood Crest beach! Our professionally designed condo is located within the very desirable Monarch Condo Resort. The large heated pools, hot tubs, kiddie pools and 'grill and chill' areas will only enhance your stay at the Crest. The Wildwood area features many free/inexpensive activities for you to enjoy such as parades, movies on the beach, fireworks, etc. Something for everyone in your group to enjoy!!! The condo is just a block to the start of the infamous Wildwood boardwalk, the beach, and a bike path. We have included 2 adult bikes, a 20 inch children's bike and a wagon to help you get around town. We are just a few blocks from the convention center as well. You can always hop on the trolley to the other end of the boardwalk. The kitchen is stocked with everything you need to cook while you are here, but if you would rather eat out there are several restaurants within walking distance, including Little Italy and Bandanas Mexican restaurant that serves lunch, dinner, and ice cream. We are the proud owners of this unit. We wish you an enjoyable vacation! We have all dreamed of owning a home at the beach. Any beach. Then we found Wildwood Crest. It was the perfect combination of all a shore town has to offer. Everyone can find something they enjoy here or within a short drive. We love all of the activities when the kids are along, the spacious beaches, the restaurants within walking distances to name a few. We fell in love with the Monarch Resort immediately. 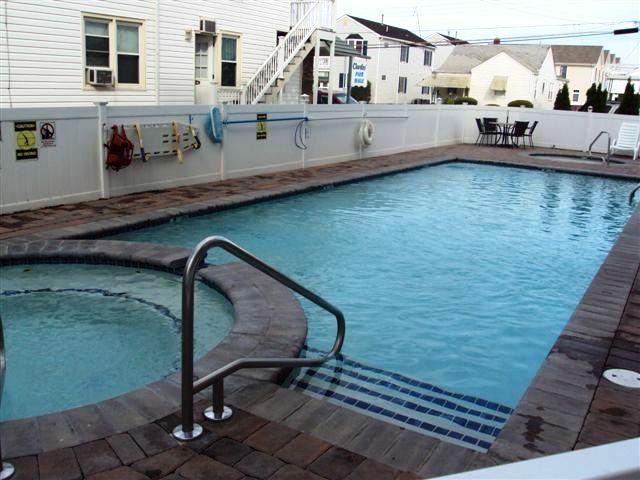 The large pool areas and common areas seperate these condos from any other in the Wildwood Area. We know from experience how hard it is to travel with our families to the beach and to bring all of the gear that you need so we decided to leave some of our personal possessions in the storage area for you to use. Chairs, bikes, a wagon, a beach cart, even crab traps!! And again, we need to mention the pool areas at our resort. Bigger than the usual condo pool and each pool area includes a kiddie pool and a hot tub. Having access to a pool makes your beach vacation even more enjoyable. This condo is a resort like feel with a private courtyard for the complex with two pools, hot tubs and kiddie pools. It also has an eating area and. Weber grills for outside grilling and dining. The beach is just a very short block away. partial views of beach/ocean and dunes from front porch. In unit. Bring laundry detergent. Two assigned parking spaces for unit. 2 spaces provided in lot-piggy back style, back to back. Dining Room Table for 6 with 2 additional seats at the breakfast bar. 50' Flat screen Smart TV in living room, flat screen TVs in each of 3 bedrooms. Small Boom Box for Unit with CD Player. Yes, with some DVDs supplied. Many Adult and Children's' Books. Many DVDs and VHS tapes provided. Courtyard Area with Gazebo, sitting and eating area. Rentals 1block north east & bike rakes outdoors at complex to lock up. There is a dining area between the two pools with several tables for eating outside. Mini-Golf down the street and many 18-Hole Golf Courses close by in Avalon, Stone Harbor, Cape May,etc. with two Par-3 Courses nearby in Avalon & Villas called Laguana Hills and Menzes. Both pools are heated. The pools are large and different sizes. They are located at different ends of the complex, giving the property a 'Resort' feeling. Two, one at each outdoor pool. Very neat and clean. Perfect location. Three years in a row same condo. Would not change a thing. My family and I enjoyed our time in this condo. It in a great location, and the condo itself is awesome. We definitely will rent again. Very comfortable, very clean, and well equipped condo, only 1-1/2 blocks from the beach. The elevator access was a godsend, with a 5 year old & 2 year old, as was the storage area that was supplied with a beach cart, chairs & toys. I'm pretty sure I even saw a bike or two, in there. Our little ones enjoyed the kiddie pool...there are also 2 adult pools and a hot tub. The grilling area also had a pretty good-sized picnic area. The condo, itself was so much cleaner than some of the other places I've stayed in Wildwood Crest! When you're traveling with 2 little ones, you really appreciate spotless bathrooms and a washing machine! I was impressed that the cleaning company left us a note about one of the bathroom rugs, being in the dryer. There is a closet, that is well stocked with games and books for all ages, and even a few puzzles my grandsons could play with. A couple of cons, that have nothing to do with the condo or the owners, and would never stop me from renting again: 1. The master bedroom does not get very dark, at night, due to the lights from motel, across the street. I didn't mind, but if you do, you should probably choose one of the other 2 bedrooms. 2. The assigned parking spaces are VERY close to the wall on one side of the garage, which makes it very difficult to get in/out of, especially if there is someone parked in the next spot. 3. Getting the beach cart from the storage unit, thru the door from the courtyard, and then thru the tiny area at the bottom of the stairway, and then thru a second door into the garage can be a bit unwieldy. We asked someone who works there if there was an easier way to get out to the sidewalk, but he did not know of one. He said he was new to work there, though. He was very helpful with other questions we had. All in all, a very nice vacation! We couldn't have asked for more! Thank you Sue & Dominic! We loved our first famille trip the condo was relaie good and clan and the kids loved the pool. This is our second time in this condo. It is spacious and clean, the kitchen is fully equipped with everything you need as well as everything you need for the beach which is only a short block away. The pool area has plenty of lounge chairs, umbrellas and tables and gas grills. Stores, restaurants, bakery and ice cream are within walking distance. We will come back to stay again for sure, you won't be disappointed. The place was great . It was so very comfortable. It had everything available . The kids loved the pool . It was so close to boardwalk and restaurants. Summer rentals run from Saturday to Saturday. Off season rates are available upon request.